The thing about burritos is that they can be secretly hiding an inner core of refried beans that is many time hotter than the surface temperature of the outer tortilla shell. You won’t discover this until it is too late and your mouth has been melted shut. and that is why you always let a friend have the first bite. This comic made me really want to go to Chipotle. Unfortunately, it is 1 AM and Chipotle is closed. I understand that happens mainly with those frozen Microwaved burritos. I have never ever had one of those in my life, and thus, never experienced the burny refry bean burritoness. I do tend to make my own carne asada burritos, sans beans, so additionally no molten beanness. Always been more of a chimichanga man myself. 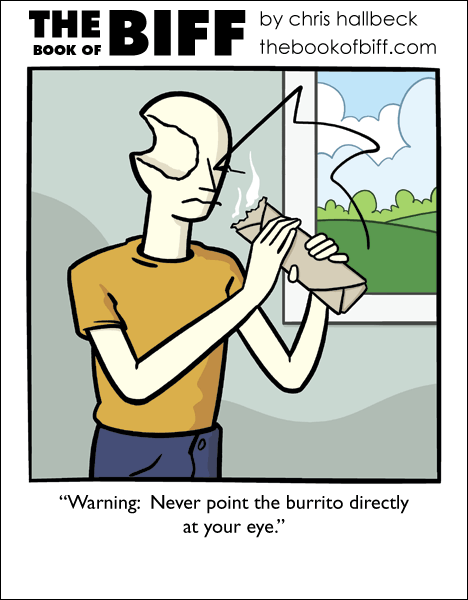 Do not look into burrito with remaining eye! Actually, my fear is not the explosively molten core, but the tooth-breaking hidden pocket of ice. Always been a quesadiea man myself. Please don’t kill me for butchering the Spanish language. Try a chees soufle. Those burning my lips éverytime. The outside seems cooled down..and then the inside is as hot as lava. I have had one of those frozen burritos go nuclear in my microwave, causing a huge mess. I did not realize they could explode… obviously neither did biff. It looks like Biff accidentally ignited the core of the delicate and dangerous but delicious Plasma Burrito. You have to get it to the right temperature so it coalesces, but not so hot that it ignites. It’s in reverse on my end. When i put things in the microwave to heat them up… the plate gets hotter then the food. so when i take a spoonful..it’s ice, but the plate is molten. I lived off pizza pockets and microwavable burritos for a while when I lived in residence at university (we weren’t allowed hotplates or even electric kettles in our rooms, but there was a microwave in the communal lounge area). Cafeteria hours were pretty limited, and totally not compatible with my schedule, so microwaving was the only option I had for getting hot food. I think I went a good three months without taste buds due to constantly burning them off on hot filling. i never would have guessed that a bowl of spaghetti sauce could be burned to cinders on the outside and yet remain near frozen on the inside….. This happens to me every 21st Tuesday. Another classic “Why isn’t any water coming out? *puts face to hose and looks inside*”. keep your finger off the trigger until you are ready to bite and never squeeze.